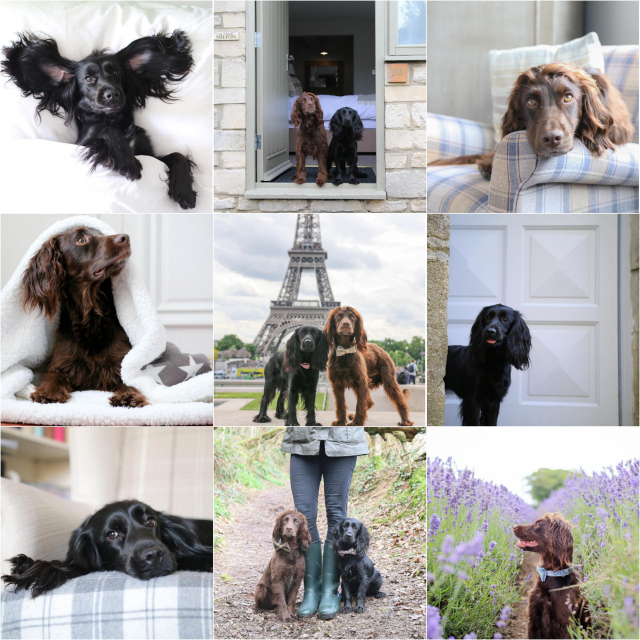 adjective"having achieved fame, wealth, or social status"
With Sev and Lily's instagram following making it's way up to 20,000 followers, I thought I'd share our tips on how to run a successful dog instagram account. Don't worry, no one expects photographers behind the cameras, however a good quality camera or phone is much needed. A long with good light, most cameras will give you a great image to post. Remember, no one wants to see a half hearted, blurry photo, take a pride in what you're showcasing. Running any instagram account can be time consuming, especially when you have a full time job [and a life!] so being prepared and getting organised will help your dog instagram account flow better. If you're on a walk or day out, make sure you take a few photos and keep them ready to post. Photographing and taking the photos on the day makes me feel rushed. @SpanielLife try to post at least once a day, which is perfect to keep your followers engaged and allow you to be noticed by new followers. As well as posting to your account, it's really important you're following accounts you love and sharing your comments and likes on their photos too. Being active and getting to know other dog instagram accounts is all part of the fun, you can't have it all without giving something back. Remember it's just for fun, and although there are perks, making sure you enjoy it will be a large factor on making it a successful dog instagram account. Sharing your photos, and making new friends is such a large factor of instagram life. If it starts feeling like hard work or a chore, it's really important to make sure you're doing it for the right reasons.